Progress on 3D-ICs, using HBM with fan-outs, and other new approaches. A new wave of 2.5D/3D, fan-out and other advanced IC packages is expected to flood the market over the next year. The new packages are targeted to address many of the same and challenging applications in the market, such as multi-die integration, memory bandwidth issues and even chip scaling. But the new, advanced IC packages face some technical challenges. And cost remains an issue as advanced packaging is still relatively expensive for the masses. 3D-ICs: After years of modest success in developing true 3D packages, the industry is launching a new version of the technology for logic on memory and logic on logic integration. This enables hybrid chip architectures, SRAM cubes and other technologies. Chiplets: With chiplets, you have a menu of modular chips, or chiplets, in a library. Then, you assemble chiplets in a package and connect them using a die-to-die interconnect scheme. Fan-out on substrate packages: These support high bandwidth memory (HBM), while some will break the sub-µm line/space barrier. Each technology is geared toward a different application. Generally, though, the idea behind these and other advanced package types is to integrate multiple die in the same package, which is a form of heterogeneous integration. This, in turn, enables the package to perform a specific and advanced function in a small form factor. Heterogeneous integration has other implications, as well. It is becoming an alternative to IC scaling. Packing more transistors on a monolithic IC is becoming more difficult and expensive at each node. Another way to get the benefits of scaling is by putting multiple and advanced chips in an IC package. Addressing the ongoing memory bottleneck issues in systems is another driving force behind advanced packaging. In systems, data moves between the processor and memory. But at times this exchange causes latency and power consumption, which is sometimes called the memory wall. Regardless of the technology, the industry needs to keep a close eye on IC packaging. The overall IC packaging market is projected to reach $68 billion in 2019, up 3.5% over 2018, according to Yole Développement. Of those figures, advanced packaging is projected to grow at 4.3% in 2019, compared to 2.8% for traditional/commodity packaging, according to Yole. IC packaging is important for several reasons. First, a package encapsulates a chip, preventing it from being damaged. A package also connects the device to a board. Second, smartphones and other products require chips with small form factors. This requires small, fine-pitch packages with good electrical performance. Third, in some cases, OEMs require a small, multi-die package that performs a specific function, sometimes known as a systems-in-package (SIP). For example, you may need to integrate a communications device with some control circuitry for an IoT or sensing application. “On the SIP front, you are also going to see a lot of heterogeneous integration,” ASE’s Rice said. Fourth, customers continue to embrace advance packaging to solve various issues. “Advanced packaging technologies, such as 2.5D, 3D TSV, high-density fan-out, and low-density fan-out, will continue their current courses. We will continue to see incremental improvements in materials, thinness and electrical performance in all sectors of packaging,” said Ron Huemoeller, corporate vice president of R&D at Amkor. For years, the industry has been developing advanced packages to address other challenges in systems, such as the memory wall. In today’s memory hierarchy, SRAM is integrated into the processor for cache. DRAM, which is used for main memory, is separate and located in a dual in-line memory module (DIMM). And disk drives and NAND-based solid-state storage drives (SSDs) are used for storage. To help solve the problem for high-end applications like servers, the industry is moving toward 2.5D technologies. In 2.5D, dies are stacked on top of an interposer, which incorporates through-silicon vias (TSVs). The interposer acts as the bridge between the chips and a board, which provides more I/Os and bandwidth. In one example of a 2.5D package, a vendor could incorporate an FPGA and HBM. Targeted for high-end systems, HBM stacks DRAM dies on top of each other, enabling more I/Os. For example, Samsung’s latest HBM2 technology consists of eight 8Gbit DRAM dies, which are stacked and connected using 5,000 TSVs. In total, it enables 307GBps of data bandwidth. In comparison, using conventional DRAM, the maximum bandwidth of four DDR4 DIMMs is 85.2GBps, according to Xilinx. In most versions of 2.5D, the chips are situated side-by-side, although there is some development underway in using “pillars” on top of those chips. But in either case, the memory resides closer to the processor than it would in a classical planar design, and the throughput to external memory is faster. Beyond 2.5D, the next big leap is 3D-ICs or vertical stacking, which promises faster access and lower latency between the memory and processor. 3D is an overused term that means different things to different people. Some call 2.5D a 3D technology. Technically, a DRAM stack, which has been wire-bonded, is also 3D. 3D-IC technology is not new. It has been in development for years. In 2011, for example, Micron announced the Hybrid Memory Cube (HMC), which stacks memory dies on a logic chip. In 2018, Micron dropped the HMC due to lackluster adoption. There appears to be progress on many of these issues, which could finally make 3D-ICs a reality. Vendors now are talking about various products in the arena. For example, GlobalFoundries is developing an “SRAM cube.” Generally, SRAM is integrated with the processor, but SRAM takes up an inordinate amount of real estate. Instead of integrating SRAM with the processor, an SRAM die is stacked on top of the processor and connected with TSVs. The resulting device is an SRAM/logic stack. Beyond that, GlobalFoundries also is developing a combination of 2.5D/3D technology, which promises to enable even faster access to memory. For example, in a 2.5D package, you would place three separate memory stacks on an interposer. The first one is an SRAM cube, which is situated between two HBM stacks on the interposer. Meanwhile, Intel recently launched a new 3D packaging technology called “Foveros.” This is not one product, but rather it serves as a technology to enable multi-die packages. It allows chips to be broken up into smaller IP blocks or chiplets, which are connected using an active interposer. Intel says it has solved the technical hurdles that have hampered 3D-ICs. “The first thing is solving the two or three intractable problems like thermal and power delivery. It’s a challenge and hasn’t been easily solved. We’ve come up with new innovations to solve that,” said Wilfred Gomes, a senior principal engineer at Intel. All told, Intel’s Foveros enables more advanced forms of heterogeneous integration, if not a different way to scale a device. On paper, the technology could match the functionality of an integrated system-on-chip (SOC), according to Intel. Intel hasn’t given up on chip scaling, but Foveros provides some new options. For example, using this approach, Intel recently unveiled a new hybrid CPU platform, code-named “Lakefield.” This combines a 10nm processor core with four of Intel’s Atom processor cores into a tiny package. Intel and others are paving the way toward the chiplets model. In chiplets, the idea of putting together different modules like LEGOs has been talked about for years, but few have implemented it. Kandou Bus has developed an interconnect fabric, which serves as a die-to-die interconnect for chiplets in a package or module. The company is working with several groups in the arena. So when will chiplets take off? “Many prototypes have already been built for products that use our Glasswing SerDes technology and we anticipate volume production by middle 2019,” Shokrollahi said. “But broad industry adoption of a chiplet strategy and development of interoperable chiplets is probably still a couple of years away. “There are still many questions about how to design, manufacture, assemble and test chiplets and then support these solutions in the field. There are additional challenges when chiplets come from different companies or are manufactured in different foundry processes. Kandou has worked through some of the interface issues, at least from a SerDes perspective, but we definitely see a need for broader industry engagement and cooperation to create a common framework,” Shokrollahi said. Meanwhile, momentum is building for another packaging technology called fan-out wafer-level packaging (FOWLP). In fan-out, the dies are packaged while on a wafer. Fan-out doesn’t require an interposer, making it cheaper than 2.5D/3D. But packaging customers want HBM, and HBM was only available in 2.5D/3D packages. That is likely to change. The industry currently is working on high-density fan-out packages that integrate and support HBM. These packages could give customers a new and cheaper option for HBM technology. With or without HBM, fan-out involves the same basic structure. 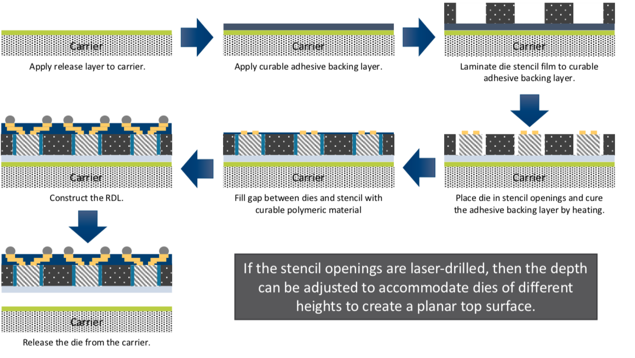 “In FOWLP, chips are embedded inside epoxy molding compound and then high-density redistribution layers (RDLs) and solder balls are fabricated on the wafer surface to produce a reconstituted wafer,” explained Kim Yess, technology director for the Wafer Level Packaging Materials business unit at Brewer Science, in a blog. RDLs are the copper metal connection lines or traces that electrically connect one part of the package to another. RDLs are measured by line and space, which refer to the width and pitch of a metal trace. Initially, fan-out didn’t incorporate a substrate as a base material. At times, though, a substrate-less fan-out package is prone to warpage and/or stress due to a mismatch between the dies and the epoxy mold compound. In 2016, for example, ASE introduced a technology called Fan Out Chip on Substrate (FoCoS). Targeted for servers, the first customer for FoCoS incorporated separate 16nm and 28nm dies in the same package. The package has four metal layers with a 2-2.5µm line/space configuration. The initial FoCoS package is based on a chip-first flow. Slated for this year, the next-generation FoCoS supports HBM. This version is capable of 2-2µm line/space, with 1.5-2µm due out in the future. “Although InFO_MS is in the early stages of R&D, this technology is meant to integrate HBM onto a substrate directly without an interposer. But it is not easy to achieve this technically,” said Favier Shoo, an analyst at Yole. TSMC also is developing an ultra-high density version of InFO, which brings fan-out into the sub-µm regime. Until now, the most advanced fan-out had RDLs down to roughly 2-2µm line/space. However, TSMC is readying InFO at 0.8µm with finer geometries in R&D. “It’s the same architecture. This interconnect density is important for bandwidth improvement. We’ve also minimized the parasitics whenever possible,” said Doug Yu, vice president of R&D at TSMC. To pattern the RDL layers in advanced packages, the industry uses various lithographic systems. It’s challenging to pattern the finest RDL features in packages. In fan-out, die shift is one of the bigger problems. During the flow, the dies tend to move in the epoxy material, causing variation and other issues. Brewer Science is working on an approach to solve the problem. The technology uses a thin film in a mold compound that works like a stencil. “Die stencil is an alternative to using the traditional EMC fan-out approach. It doesn’t require the use of a typical EMC in order to create the constituted substrates. It is advantageous because it reduces the warpage commonly observed with EMC fan-out technology and is flexible in integrating all sorts of dies into the package, independent of their sizes and features,” Brewer’s Yess said. So going forward, customers will have new and different advanced packaging options on the table. These technologies are impressive, at least on paper. But as before, it’s easier said than done to integrate them in systems, especially at the right price point for demanding customers.